Glaswegians have their own favourite parts of the city, be it the West End, South Side, City Centre, Merchant City or the East End. I’m ashamed to admit that even though I’ve lived in the city since moving back in 2006, I still have no idea where most places are. I have my “comfy” areas of Merchant City, Sauchiehall Street, Argyle St, Buchanan Street, Great Western Road and Byres Road. Other than that, I have literally no idea. Sure, there are horror stories about certain locations thanks to TV documentaries, but Glasgow is a wonderful place. Why else would it have been named City of Culture in the 90’s, announced as the host for the upcoming Commonwealth Games and where Hollywood comes to film with A List movie stars? To me, Glasgow is the best city in Scotland. It has the best shopping district outside of London, an amazing night life, great restaurants and as they say; the people make Glasgow. The city is brimming full of culture, havens and hidden gems which inspire us. I’ve teamed up with American Express to help source your favourite (preferably free) hideaways throughout the city and create a digital map highlighting these for fellow Glaswegians (& tourists) to visit and give others a unique and different insight into our home town. interesting exercise routes, where do you love to run? Sitting under a tree in Glasgow Green on a sunny day with good friends & some drinks. People watching on Buchanan Street. There is a little bench near the subway station where I love sitting with a coffee and just watch the world go by. Duck Bay on the banks of Loch Lomond. Sure it’s a little outside of Glasgow but it’s where I love to go and breathe fresh air, recharging myself. It’s a great picnic spot and I love dipping my toes into the water. The buskers on Sauchiehall Street, in particular Matt Comley. I literally stop what I’m doing to listen to him. 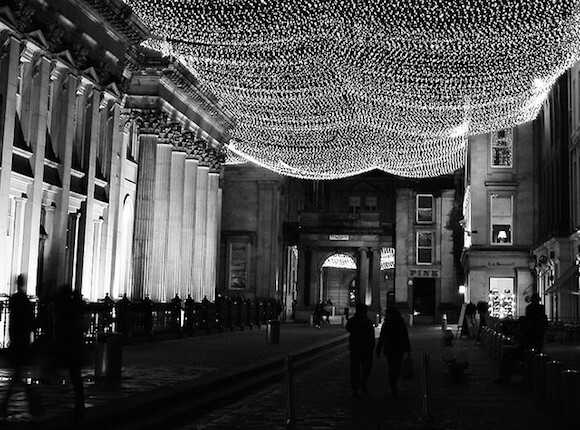 The fairy lights in Royal Exchange Square make me fall in love with Glasgow all over again. There is something about that area that is très romantic. Why are the places you love special to you? When is the best time to go? Is it a place to go solo or with family and friends? Once all the hidden spots have been collated by myself, I’ll be visiting them all, taking photographs. American Express will then be creating an informative and interactive digital map of Glasgow which I’ll be sharing with you all to help inspire you to rediscover Glasgow. I always love strolling on creswell lane behind byres road and popping into the lovely little shops. never been there! what makes it different? A real Glasgow secret is the Sixty Steps, on Queen Margaret Road, off Queen Margaret Drive (G20 6DP) – a massive retaining wall and, yes, sixty steps, that were designed by the great Glasgow architect Alexander ‘Greek’ Thomson in the early 1870s. The steps, a public right of way, look out across the river Kelvin towards Hamilton Drive, and it is a sort of fantastical folly – complete with hidden doorway and a pillared ‘bellevue’. There’s a free event to celebrate it being held as part of the West End Festival on Sunday 15 June… Come and see it for yourself. It’s awesome! wow! that is amazing! I’ve never heard of that before. Definitely need to check it out! Thank you SO much! Strolling through the greenhouse at the botanic gardens. My boyfriend took me there on my first visit to glasgow; two years later were still together and I now live in glagow, so it was one of our first dates together and definitely my first ‘date’ with the city. I’ve actually NEVER been there! I know a couple who married in there…. could be your venue sometime too 😉 thanks for letting me know! If you’ve got any more, please do share! Picnic – maybe Molensinar Park or whatever it’s called. Has a waterfall, looks nice but never been.